Biography & Genealogy: Edmon "Ned" Swift Edmonds, Class of 1873. Genealogy: Born near Delaplane, Fauquier Co., Virginia on June 4, 1849. Father: William Foote Edmonds (b. 1801 d. 1865). Mother: Mary Evelina Carter (d. 1888). Paternal grandparents: William Edmonds (Jr). and Hester Foote. Paternal great-grandparents: Col. William Edmonds (Sr.) (served in Revolutionary War) and Elizabeth Blackwell. Maternal grandparents: Judith Edmonds (sister of William, Jr.) and Moore Fauntleroy Carter. Maternal great-grandparents: Landon Carter and Miss Fauntleroy. Edmon S. Edmonds' parents were first cousins. VMI Record: Entered 1870, graduated July 4, 1873. Career: Teaching, law, engineering. Marriage: Ada Belle Chunn, June 27, 1873. Children: 1. Mary Evelina (b. 1884, d. Oct 14, 1918 - influenza epidemic). 2. Edmon Chunn (b. 1886). 3. Isabel McNish (b. 1888 d. Oct 15, 1918- influenza epidemic. 4. Asby Carter (b. 1890). Death: Died in Warrenton, VA on June 21, 1942, age 93. 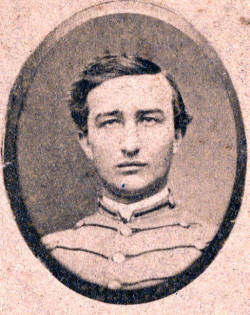 At the time of his death he was VMI's oldest living alumnus.